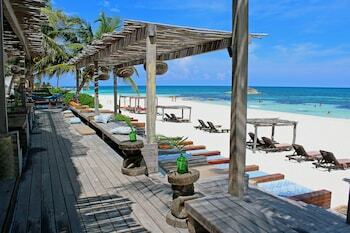 Located in Tulum, Amansala is by the sea, a 1-minute drive from Tulum Beach and 8 minutes from Las Palmas Public Beach. Featured amenities include express check-out, dry cleaning/laundry services, and multilingual staff. A roundtrip airport shuttle is provided for a surcharge (available on request), and free self parking is available onsite. With a stay at Los Tules Villas del Sol in Puerto Vallarta (Las Glorias), you'll be within a 15-minute drive of Malecon and Playa Las Glorias. Free self parking is available onsite. With a stay at this condo in La Paz, you'll be 19.8 mi (31.9 km) from Dove of Peace Monument and 22.3 mi (35.9 km) from La Paz Serpentarium. Free self parking is available onsite.